The instrumentation and control engineering field is a very broad arena. Often instrument engineers and technicians are required to have sufficient knowledge in many areas of engineering to enable them function competently as well as efficiently. (a) Mathematics – Proficiency in mathematics is mandatory to understand and carry out almost any technical job. (b) Physical Sciences – Knowledge of physical science is necessary to understand basic electricity, electronics and manufacturing processes. Pressure, level, flow and temperature principles utilize physical science knowledge. Understanding the physical sciences makes a good instrument technician. A good instrument technician must be able to read and interpret P&IDs drawings and even help to develop some when the need arises. (c) Electricity and Electronics – This knowledge is required to for the newer electronic and microprocessor based instruments and controllers. An understanding of both analog and digital electronics is necessary to maintain modern instruments and control systems. Electrical/Electronic maintenance and repair as well as pneumatic maintenance techniques are crucial knowledge areas required in the field of instrumentation and control engineering. 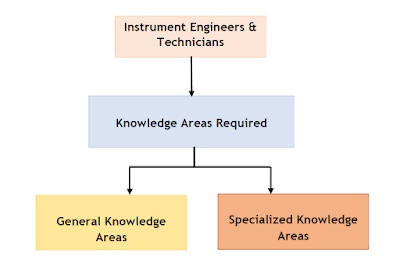 (d) Primary Elements – Knowledge of primary elements such as pressure, level, flow and temperature is required by instrument engineers and technicians. A primary element is the part of a measuring or sensing device in direct contact with the process whose attributes or characteristics are being measured. A primary element performs the initial conversion of measurement of energy and a thorough knowledge of the primary elements is extremely necessary. (e) Signal Processing and Conditioning Equipment – Signal conditioning and processing equipment helps to convert signals from one form to another such as analog-to-digital or current-to-pressure. Signal conditioning is necessary to convert a signal to usable energy that is compatible with devices that perform mathematical functions such as sum, integration, counting and square-root. (f) Process Control Instrumentation Knowledge – Knowledge of basic automatic control theory and feedback control loop is mandatory. The concept of gain, proportional band, integral action, manual bias etc must be understood in both analog and digital control circuits in addition to those in pneumatic and electronic systems. Knowledge of final control elements such as valve positioners and actuators is necessary to know how the control valve affects the process control loop. (g) Procedures and Documentation – Knowing how to follow correct formal procedures in performing and documenting maintenance tasks is required in order to properly maintain instrumentation and control systems. National, or industry – wide codes, standards and recommended practice as well as plant procedures must be understood and followed. 2. Programmable Logic Controllers (PLC) -operation and programming ability. 4. Communication Systems such as Local Area Networks (LAN) and Telemetry. 7. Configuration/Programming of both instrument devices and computers. 8. Process Control Applications – Feedback, Cascade, Feed forward etc. 9. Codes, Standard and Recommended Practices. 10. Nuclear Power Plant Systems.